we are truly free to welcome all that arises in our female bodies. Uma Dinsmore-Tuli, joining us from the U.K., is known worldwide for her teachings of cyclical wisdom. Much of her work is dedicated to helping us become sensitized to profound learning that arises when we listen to our female bodies and all that they have to teach us. 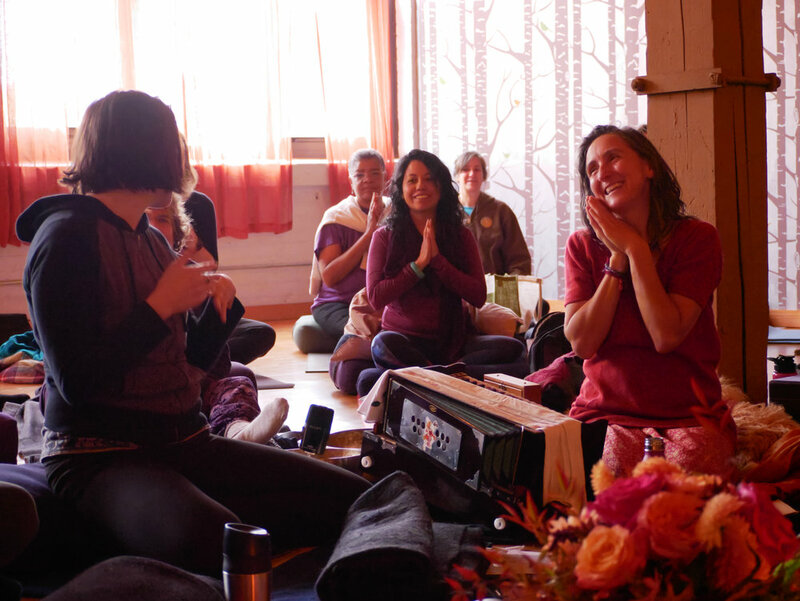 Women of all ages are welcome to come and experience the presence of the Wisdom Goddesses through movement and stillness, breath and voice, yantra and kirtan, meditations and presentations, sharing and solitude: all in re-connection with nature. Through these practices, we welcome all that arises in our female bodies, hearts and psyches, and celebrate what we learn from the wisdom and power of our life experiences. Join us among the peaceful and luscious green hills of remote Northern Wisconsin to participate in daily yoga and Total Yoga Nidra practices to honor the all of the cycles of our lives as women, as well as sacred art making, music and nature exploration. Everything offered is included and is also completely optional! You are encouraged to do what is going to nourish you- sleep in, practice early, spend time alone or among the group. Do what feels good to you. We invite you to share this experience with a friend, sister, or mother. Wednesday: Arriving to Settle. Meeting the Ten Wisdom Goddesses. Enter deep time with Sri MahaKali Ma - welcoming the power of change and time passing. Evening presentations with Chanti, Uma and Yoli. Thursday: Welcoming/Healing the Girls that we were. Calling in protection for the girls of the future, and for the Earth herself. Celebrating the power and vulnerability of youth, we meet the guardians in our own cycling lives: Ma Taradevi, Sri Sodasi (Tripura Sundari) and Bhuvaneshwari Ma. Saturday: Celebrating lifelong vitality with the twin sisters of Creativity and Sexuality. Opening to pleasure, creative expression and being in the moment. Meeting Kamalatmika and Matangi Evening celebration and integration. Sharing in community, through our fire circle, with testimony, yantra sharing, recollection, poetry, song and dance. Sunday: Circling home with the Grandmother. Honoring the medicine circle of all Ten Wisdom Goddesses gathered together in the directional Yantra. Paying our respects to the Grandmother of them all: Dhumavati. We invite direction for our onward journeys, assured of protection and re-connected with respect for wisdom. Yoli Maya Yeh will be available for private shiatsu sessions for $100 per hour. Olga Chwa will be available for massage as well. If you are interested in booking one of these limited spots please email them directly. Ranging from $250-$495 per person based on accommodation style, see options below. All women - whether you are a complete beginner to yoga or a super-experienced yogini. Women exploring their menstrual and menopausal experiences as a means to health, wellbeing and spiritual empowerment. Yoga teachers and yoga therapists – it can count towards Continuing Education points depending upon the requirements of their professional associations. Health care practitioners with a living practice of yoga who want to support their clients in positive experiences of women’s inner wisdom. Are you pregnant? Breastfeeding? Do you have young children? Or perhaps you want to know more about your eligibility – Please see our Statement of Inclusion page which is a genuine welcome from Uma and details the appropriate support for for women considering attending this retreat. Considering bringing a child to this retreat? Please read this. Wondering if this retreat is right for you? It might be helpful for you to read this. journey through womanhood. Yantra choice TBD but might be Ma Tara- pictured at right! 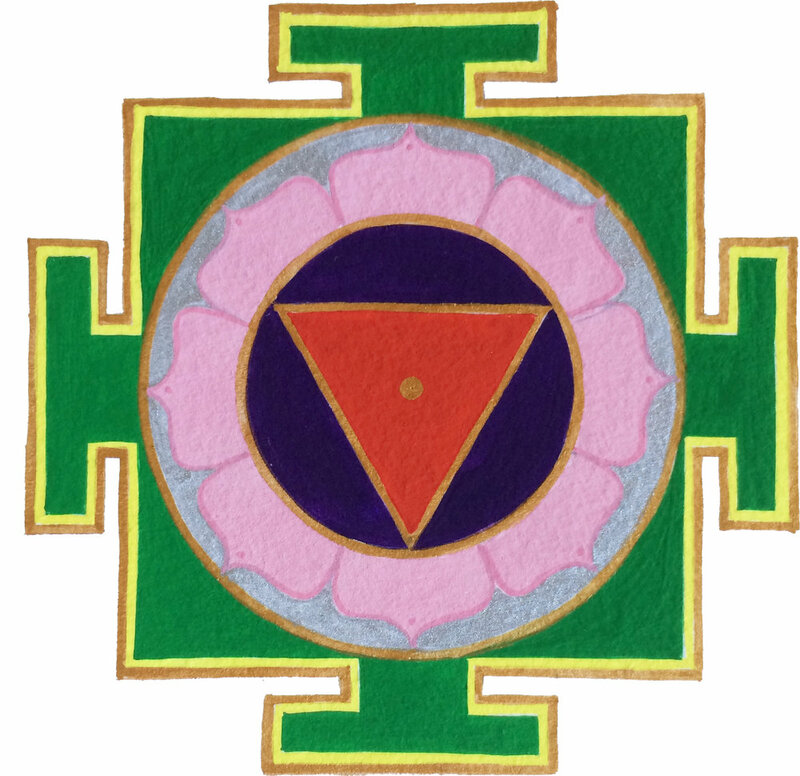 Learn the power of yantra shakti from a wise and experienced teacher! Wind down and tune in with Yoli Maya Yeh in devotional chants, prayer and reflection these evenings. Honoring the sacred with a fire offering and voice let us commune with Nature and ourselves while honoring the sacred in our lives. 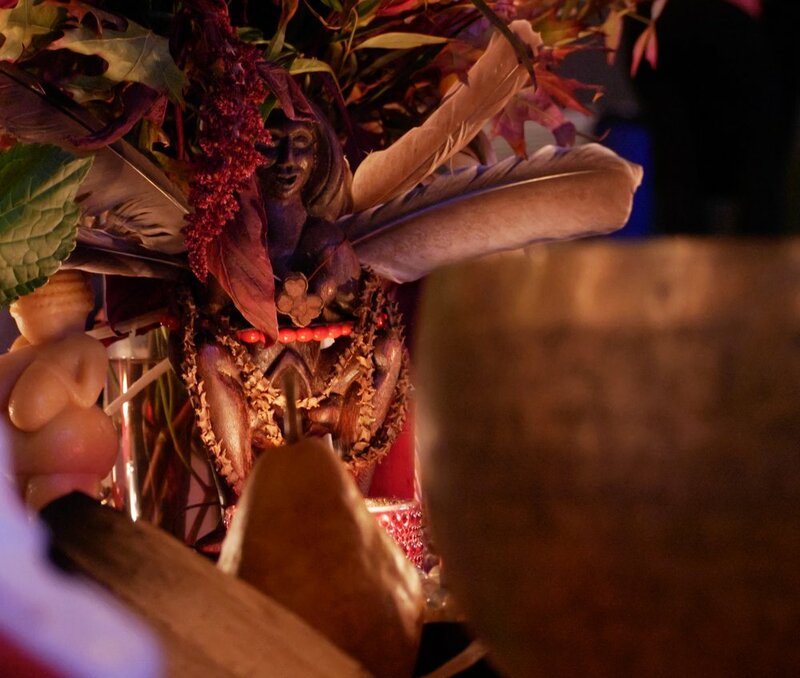 Yoli will draw from Tantrik, yogic and Native American lineage practices in the evening offering. Choose and add your "Accommodation/Meal Package" and to your cart, then check out. If you have financial concerns to make this retreat possible please review our payment plan option. This package includes all of the programming offered from Wed-Sun as outlined in the description. It does not included lodging and meals and should be added to your cart separately. room alone "Private Occupancy", or with a room mate(s) "Shared Occupancy"
If the accommodation style that you are interested in is not available please contact cassie@anandawithin.com to inquire about other options. You may request a refund for your “Program Package and Room and Meal Package”, less a $200 administrative fee. Your reservation may be transferable to a friend or someone on the wait list (if applicable) on or before May 31st for a $20 administration fee. You will be responsible for finding this participant if there is no wait list, linking them with Amala and paying the administrative fee. In the event that you cancel after June 1st, or simply do not show up, no refunds or credits will be given. Your reservation may be transferable to a friend or someone on the wait list (if applicable) on or after June 1st for a $40 administration fee. You will be responsible for finding this participant if there is no wait list, linking them with Amala and paying the administrative fee. If you cannot find a friend to transfer to, no refunds or credits will be given. In case of a health or family emergency cancellation: Amala will retain a $200 administrative fee and may refund you additionally based on your circumstance and whether we are able to fill your spot. This will be at Amala's discretion and decided within 2 weeks after the end of the retreat. Uma met yoga in 1969, at the age of four, and fell in love. She’s been practicing ever since, and teaching yoga since 1994. A yoga therapist with special expertise in yoga therapy for women’s health, Uma is a mother of three, and has written four books on yoga for women, including the massive Yoni Shakti now in its fourth printing. Uma works internationally, sharing yoga retreats, trainings and empowerments that support the natural arising of prana shakti: the power of life. Since 2001 she has trained a total of over one thousand specialist teachers in Total Yoga Nidra, Women’s Yoga (womb yoga for all stages of women’s lives), and therapeutic yoga for pregnancy, birth, and postnatal recovery. Uma’s passion as a writer and as a teacher is to transmit the clarity of awareness, creativity and profound vitality nourished by yoga tantra. Her practice and teaching respects the cyclical powers of the living earth, and honours human life cycles as spiritual initiations (including conscious menstruation, menopause, birth and postnatal recovery). 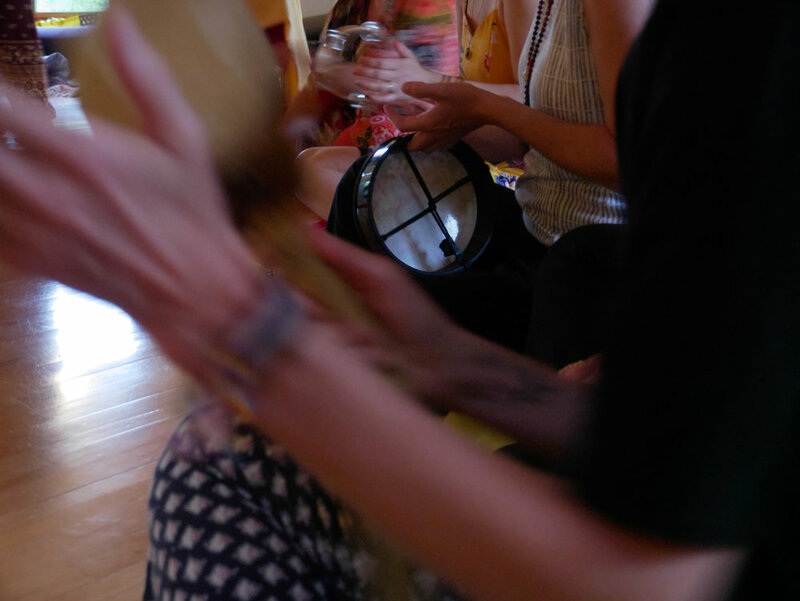 Chanti’s passion is to inspire students to rediscover their creative self through personal inquiry, effortlessness, ritual, sangha and sadhana. She has been studying and teaching yoga in the Sri Vidya lineage since 2005. Chanti believes that creativity is one of the most essential tools in guiding students towards living a joyous and purposeful life. She is masterful at ritualizing the teachings of the tradition with creative tools in order to explore the soul. Yoga Therapist (VYASA, Yoga for the Special Child) and an Educator in Comparative Religions and Global Studies (MA Comparative Religious Ethics). Lela is co-owner and co-founder of The Amala School of Yoga and Grateful Yoga of Evanston. She is a certified Kripalu Yoga and ParaYoga teacher, Phoenix Rising Yoga Therapist approved by the International Assoc. of Yoga Therapy. Lela has been teaching group and private prenatal, and Hatha yoga full-time since 2005. This gathering of dear friends and like-minded souls is a dream come true for Lela to support! Cassie has been passionate and dedicated to supporting and empowering women with yoga as an experienced pre/postnatal yoga specialist since 2007. She offers group classes, private lessons, couples classes and workshops including Yoga for Labor and The Pregnant Practice. She has been training teachers to specialize in the perinatal life stage in Chicago since 2010 and co-founded The Amala School of Prenatal Yoga, which offers a 95 hour teacher training and other programs in Chicago. The Christine Center is nestled in 125 acres of tranquil woodlands in north central Wisconsin, two miles from Willard, about one hour south east of Eau Claire. It’s about a three hour drive from Minneapolis and Madison, four hours from Milwaukee and five hours from Chicago. By Car: Please follow these printable driving directions: Driving to the Christine Center. These pages give directions from regional major cities. Use caution with Mapquest or Google Maps. Their directions may get you lost in this rural area. Please note: this is deer country. When traveling early morning or late afternoon or evening, use caution. Slow down, actively watch for deer at the sides of the road. If you see deer, slow way down. Be safe! Also, wild turkeys do NOT move out the way for you. Slow Down. By Air, Bus, and Rail: Flights are available into the Minneapolis International Airport, Central Wisconsin Airport, and Eau Claire Airport. The closest bus station is in Eau Claire. The closest Amtrak station is about 1.5 hour’s drive in Tomah, WI. We can arrange to pick you up and drop you off. We encourage you to share the drive, if you are seeking a travel partner you can arrange this through the secret Facebook group which you will be invited to join upon registration. Plan to make this a sacred time to treat yourself to all that would bring you nourishment and joy. Here are a few ideas of what you might like to bring along; mala beads, neti pot, tissues or handkerchief, flashlight, water bottle, journal, blanket, pillow, something to place on the altar, red and gold clothes to wear for our Saturday evening celebration, meaningful fabrics that you can use for our optional craft project, any of your portable hobbies (ie; stitching, sewing kit, crafts). Please know that ample yoga props will be essential in creating the upmost experience for yourself. Even if you are not accustomed to using props they are quiet necessary for the types of practices you will be offered on this retreat. Please plan to bring a mat, a bolster and a blanket and preferably also: a cushion, a second blanket, a couple of blocks or a third blanket and an eye pillow. Sisters please remember, when we come together, in circle, to celebrate our cycles, those cycles are listening! And this means, that even if you haven’t bled for years, and even if you aren’t due to bleed during the time of retreat you may bleed. So please bring whatever you choose to receive your sacred menstrual moon flow. Choose wisely, with the earth in mind, and bring non-bleached and eco products that are Earth and Yoni friendly, so you can be prepared to enjoy your flow if she comes on the retreat. You may also want to bring blankets or cloths or mats for sitting out on the good earth. Bring only the truly comfortable clothes and shoes in which you are happy to walk through trees here in this beauty - and perhaps something for the evenings that lifts your heart, something you can wear with joy!